The best way to lower lung cancer risk is also the most obvious: stop smoking. However, this isn’t the only way to reduce your senior loved one’s risk of developing lung cancer. There are several safety and lifestyle changes he or she can make to boost respiratory health. Here are five effective ways to lower lung cancer risk in the elderly. To reduce lung cancer risk, your loved one needs to reduce his or her exposure to tobacco. 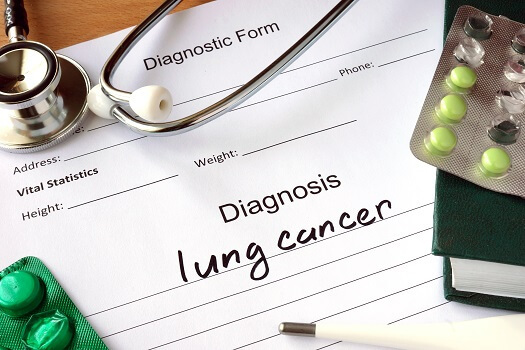 Statistically, only 10 to 15 percent of the people diagnosed with lung cancer have never smoked. Most people with lung cancer are either former smokers or current smokers. If your loved one has given up smoking, that’s a great first step. As soon as smokers quit, their lungs slowly but surely begin to repair the damage done by tobacco. If your loved one is still smoking, there’s still time to quit. Smoking cessation can be especially difficult on seniors, so it’s always a good idea to speak with your parent’s doctor before embarking on a smoking cessation plan. While staying away from tobacco is one of the best ways to reduce lung cancer risk, following a diet rich in fruits and vegetables and low in fat can also help. Seniors who smoke should be wary of redressing their nutritional deficits with supplements. Studies show that smokers who take vitamin A supplements are more likely to get lung cancer. If your loved one does develop lung cancer, he or she may need help to continue living at home. Performing daily tasks while simultaneously managing the symptoms of a serious illness can be challenging for seniors. The Oshkosh live-in care experts at Home Care Assistance are available 24/7 to make sure your loved one has the care he or she needs to remain safe and comfortable while aging in place. Most of the known environmental causes of lung cancer are airborne. While people usually know when they’re being exposed to cigarette smoke, other pollutants are more insidious, including radon, a radioactive gas that can damage lung cells. Seniors who spent most of their adult lives employed in the construction or chemical industries may have been exposed to toxins such as asbestos, tar, chromium, soot, or nickel. Even everyday air pollution such as the fumes from diesel engines can contribute to the development of lung cancer. To protect your loved one from environmental toxins, make sure he or she isn’t being exposed to dangerous substances at work or at home. You can find simple DIY air quality tests at local stores, or you can hire a specialist to perform more extensive tests. If your loved one uses a private water source such as a well, make sure the water has been tested recently. Public water sources are treated to remove harmful toxins, but private water sources may contain unhealthy elements. For example, drinking water that contains an unusually high level of arsenic increases the risk of developing lung cancer. Being a caregiver often involves overseeing maintenance of the senior’s home, and the accumulated responsibilities can be exhausting. There are a variety of reasons family caregivers should consider respite care. Oshkosh, WI, families often have additional responsibilities that make it more challenging to provide the care their senior loved ones need and deserve. A professional respite caregiver can take over your important caregiving duties, allowing you more time to focus on yourself. Cardiovascular exercise strengthens the lungs, making it a healthy habit for seniors who want to prevent lung cancer. Former smokers may want to ease into an exercise regimen. Trying too much too soon may overstress the lungs. Once your loved one has found a cardiovascular exercise he or she enjoys, whether it’s power walking or water aerobics, he or she should try to do it three or four times a week. A diagnosis of lung cancer is difficult for the entire family. If your senior loved one has been diagnosed with a serious condition and needs help with tasks like meal prep, transportation, bathing, and grooming, reach out to Home Care Assistance, a leading provider of home care Oshkosh, WI, families can trust. We also offer comprehensive care for seniors with dementia, Alzheimer’s, and Parkinson’s. To learn about our high-quality in-home care services, give us a call at (920) 710-2273 today.